Very glittering. Very Deco. Very elegant. 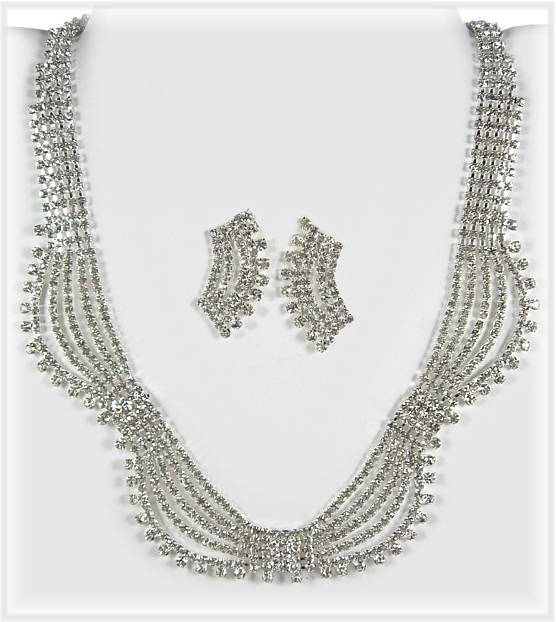 The classic swags on this stunning necklace and earring set have been given a contemporary and edgy twist by the addition of an extra row of single rhinestones, which border the swirls giving them a dramatic and very unusual look and feel. The effect is stunning and is echoed in the earrings. The entire Set is created in small rhinestones which fit tight to each neighbouring jewel, so there are no gaps, just a continuous line of brilliantly shimmering rhinestones. Necklace: 37cm (14½") plus 10cm (4") extention. Earrings: .3.8cm (approx.1½").